The first house is also your ascendant or rising sign, which we covered in “The Self” section. This house is an angular or cardinal house, which means what goes on in this house is quite forceful and prevalent in your life, and will often reveal information about yourself you’ve already come to know. It’s also one of the houses in your natal chart that’s going to have the most impact on you. This house is a succeedent house, which simply means “following” or “subsequent to” the leading angular house. As a succeedent house, this is a house that provides support. This house will speak to your belongings, to what is yours, and what is supportive of the preceding angular house before it. In this case, the second house supports the angular first house. This house is a cadent house, the last house in each quadrant of your natal chart. Planets in this house are often going to have less of an impact at birth and will have greater impact as you grow. Cadent houses indicate areas of learning for us, areas where we must transform ourselves, grow, improve, and further develop from weakness to strength. In other words, cadent houses show areas of nurture, whereas the other houses, the angular and succeedent, can be thought of as more indicative of your nature or what you are born with. The third house is ruled by Mercury and the element Air. This is the house of communications and will note how you think and then how you communicate what you think to others. Traditionally it is also the house of siblings and early childhood. This house is an angular or cardinal house, which means what goes on in this house is quite forceful and prevalent in your life, and will often reveal information about yourself you’ve already come to know. It’s also one of the houses in your natal chart that’s going to have the most impact on you. The fourth house is ruled by the moon and the element water. It is the house of our home and hearth. What goes on here can indicate our relationship with our parents in our youth and then our relationship with our family in our adulthood. Hereditary matters are often denoted in this house. Aspects of your past life and soul purpose can be found here, as with matters relating to your roots and heritage. The fourth house can also manifest an innate artistic talent. This house is a succeedent house, which simply means “following” or “subsequent to” the leading angular house. As a succeedent house, this is a house that provides support. This house will speak to your belongings, to what is yours, and what is supportive of the preceding angular house before it. In this case, the fifth house supports the angular fourth house. The fifth house is ruled by the sun and the element fire. It is the house of creativity and fertility. It can show our creations, our children or progeny, and our personal pursuits. The fifth house can reveal what our hobbies are, or areas that are going to be of general interest to us. This house can also indicate our love affairs and secondary relationships. This house is a cadent house, the last house in each quadrant of your natal chart. Planets in this house are often going to have less of an impact on your manifested life path. Yet these houses indicate areas of learning for us, areas where we must transform ourselves, grow, improve, and further develop from weakness to strength. In other words, cadent houses show areas of nurture, whereas the other houses, the angular and succeedent, can be thought of as more indicative of your nature or what you are born with. The sixth house is ruled by Mercury and the element earth. It is the house that best denotes our everyday life, the mundane, our daily work, our labors, and our job. This is also the house that offers insights into our physical health, body, and wellness. The seventh house is ruled by Venus and the element air. It is the house of union, partnerships, and relationships. It can often indicate who our life partners will be. It is the house of marriage. This house reveals what kind of spouse you are most compatible with and can offer insights into your conjugal life. This house is a succeedent house, which simply means “following” or “subsequent to” the leading angular house. As a succeedent house, this is a house that provides support. This house will speak to your belongings, to what is yours, and what is supportive of the preceding angular house before it. In this case, the eighth house supports the angular seventh house. The eighth house is ruled by Mars under a traditional rulership and Pluto under a modern. It is also governed by the element water. This is the house of inheritances, sexuality, power, risk, losses, desires, temptations, and how we learn to deal with our the shadow or darker side of our selves. The eighth house at the hour of birth denotes potential phases of transformations, crisis, and areas of waste in our lives that we would do well to pay attention to and thus prepare for. This house is a cadent house, the last house in each quadrant of your natal chart. This is going to be an area of learning for us, and what goes on in this house will denote areas where we must transform ourselves, grow, improve, and further develop from weakness to strength. In other words, the cadent ninth house show areas of higher learning, growth, and spiritual development that will further enhance and support both the preceding angular, the seventh house of our unions and relationships, and the following angular, the tenth house of our social status and career goals. The ninth house is ruled by Jupiter and the element fire. This house relates to how we view spirituality and religion, or mystical matters. It shows our relationship to Spirit, God, the Divine, or how well (or not well) connected we are to that collective unconscious. It is the house of divination, the house of journeys, higher education, and self-actualization. This house will offer a sense of your life philosophies. The tenth house is ruled by Saturn and the element earth. It is the house that denotes the social status we achieve in life, how we advance through life, our reputation, our professional destiny, and our aims in life. This house is the house of glory. This house is a succeedent house, which simply means “following” or “subsequent to” the leading angular house. As a succeedent house, this is a house that provides support. This house will speak to your belongings, to what is yours, and what is supportive of the preceding angular house before it. In this case, the eleventh house supports the angular tenth house. The eleventh house is ruled by Saturn under a traditional rulership and Uranus under a modern. It is also governed by the element air. This is the house of community. This house denotes who our friends are, what our relationship to our community is, and how our external selves manifest in society. This is a social house, about our group involvements, humanitarianism, and how we might contribute to our community. This is also the house that denotes our social or supportive network. 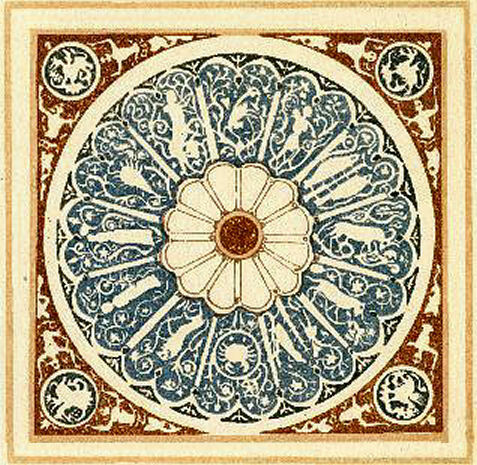 The twelfth house is ruled by Jupiter under a traditional rulership and Neptune under a modern. It is also governed by the element water. This is the house of self-awareness, but also the house of self-sacrifice. It can denote the nature of personal trials we suffer in our lives, the losses or obstacles we experience as we try to achieve our goals and self-actualization. The twelfth house will tell the story of the hero’s journey, your journey, what you must go through and endure to achieve success. The house can also show what we perceive to be our limitations. Since we perceive these attributes to be our limitations, they actually become our limitations as a form of self-fulfilling prophecy. Being conscious of the influences in the twelfth house can help us transform weaknesses into strengths. The twelfth house is a difficult house. It is the house of suffering, but through suffering, epiphanies and awakenings. It is the house of karmic difficulties, enemies, personal inner crises, and what pains us to bring us toward self-actualization. The twelfth house tells the story of the demons we face to achieve transcendence. “La Vita Nuova” by Dante Alighieri (1910). Arabic Parts (or Hermetic Lots) is a form of astrological analysis dating back to Babylonian, Persian, Hermetic, or Magian astrology before the first century B.C. They are constructed through mathematical calculations using certain planets or angles in an astrological chart. The Lot of Fortune (or Arabic Part of Fortune) is perhaps the most commonly discussed Arabic Part, which denotes the key or path to success. The Part of Spirit, Part of Commerce, Part of Love, Part of Fatality, and about two dozen other Parts are considered in an Arabic Part analysis. I tend to focus in on the Lot of Fortune and Lot of Spirit. 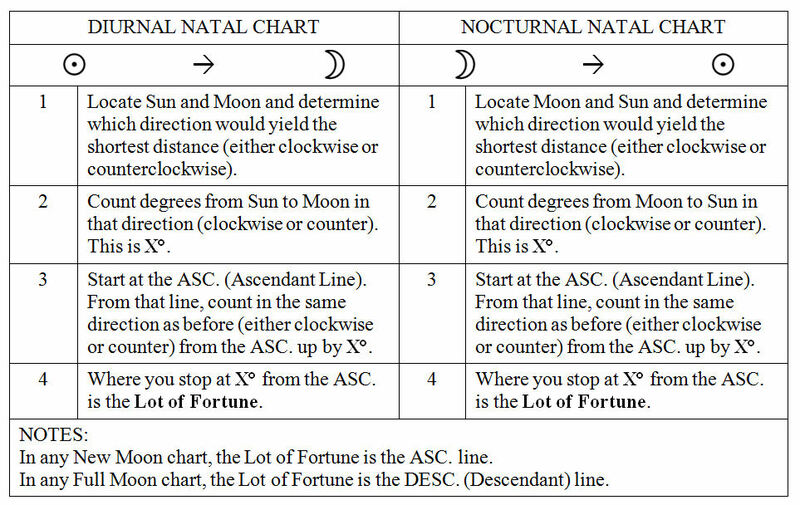 In traditional Hellenistic astrology, the Lot of Fortune, or Fortuna, was a crucial part of natal chart interpretation, though in modern interpretive approaches, it has fallen out of favor. The traditional method espoused in texts dating to 1 B.C. distinguishes between diurnal (day) and nocturnal (night) charts. A geometric calculation is rendered by calculating the degrees between the sun and the moon, and then up from the ascendant for diurnal charts and from the moon to the sun, then from the ascendant for nocturnal charts. At least that’s how it was done traditionally in the First Century. Today, many astrologers will opt for an algebraic calculation (i.e., for diurnal charts: Ascendant + Moon — Sun; for nocturnal charts: Ascendant + Sun — Moon). I follow the traditional geometric method. The Lot of Fortune indicates material well-being. It is your personal marker of success, the primary indicator of reaping prosperity in your life, and how you will achieve worldly success. The Lot of Fortune is the indicator of the native’s primary or most optimal source of prosperity and material wealth. It’s, well, it’s how you can best make your fortune in this lifetime. Study the House and Sign placement for the Lot. A Lot of Fortune appearing in House 2 could suggest finance, investments, business, the stock exchange, Wall Street; in House 4, perhaps by way of an inheritance or a family business; in House 3, through the native’s innate talents in communication, writing, public speaking, PR or marketing capabilities, etc. ; House 1, by the native’s own merits, through entrepreneurship, founding an organization, or the native as an identified character is the marketable brand in some way, like a public figure. If the Lot is in Aquarius, we’re looking at a native who works for the greater good in some way, pro bono publico and could make her mark in the community at large. If it’s in Leo with a strong Saturn aspect, a chief executive of some sort. If Gemini, here is someone who is going to talk his way to riches, through the art of negotiation and persuasion. If Cancer, a restaurateur, caterer, in e-commerce, real estate, a historian, anything food, hospitality, human services, land development, or health related would be an optimal path for material success. In Libra, art, fashion, architecture, or human services of some sort, education even. However, if there are strong Mercury or Saturn aspects, then perhaps law. When there’s a strong influence coming from Uranus, it will be by an unconventional path. Also look at the aspects formed with the Lot and whether there is greater influence from beneficent or maleficent planets. Also, note the Sign that the Lot is in. Note the rulership of that Sign. Then locate that planet in the natal chart. The ongoings of that planet in the natal chart will have a significant impact on the native’s Lot. I will read the Lot of Fortune in conjunction with the midheaven (Mc) and House 10, especially if a native is looking for greater insights into her potential career path. While the Lot of Fortune energetic expresses influences on your material and physical planes, the Lot of Spirit expresses energetic influences on your intellectual and spiritual planes. Again, the traditional First Century method is geometric, as indicated in the chart below. 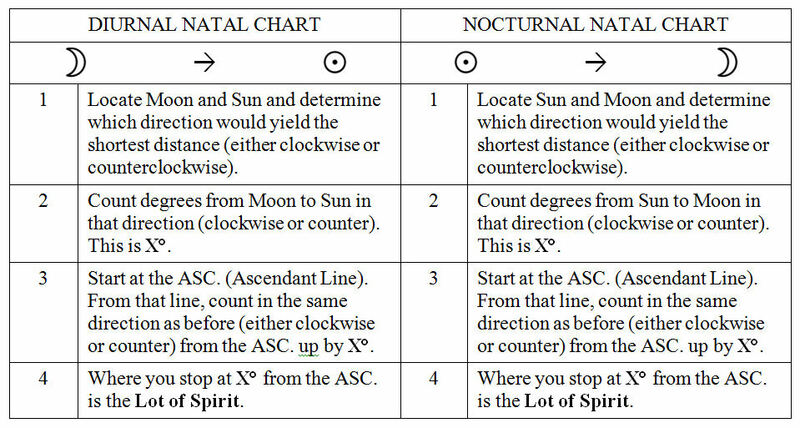 However, note that many modern astrologers use an algebraic calculation (i.e., for diurnal charts: Ascendant — Moon + Sun; for nocturnal: Ascendant + Moon — Sun). The Lot of Spirit indicates what animates you, the character your soul and spirit and how that character often manifests through the material and physical plane. So it’s an indicator of your motivations for success. Are you motivated to follow your Lot of Fortune to great material riches? Or are you more motivated to achieve self-actualization? The Lot of Spirit shows what’s within us that often emerges outward. It should be read closely in conjunction with the Lot of Fortune because the Lot of Spirit will explain the how and why for the Lot of Fortune. Some also say the Lot of Spirit helps point us to our spirit guides and the character and essence of our spirit guides. We can get a better sense of who our spirit guides are by examining our Lot of Spirit.